ThinkOut is the online platform that delivers financial analysis and forecasting for SMEs in just a few minutes, based on the transaction history from their bank accounts. Take ThinkOut for a spin and decide for yourself. How does ThinkOut work for you? 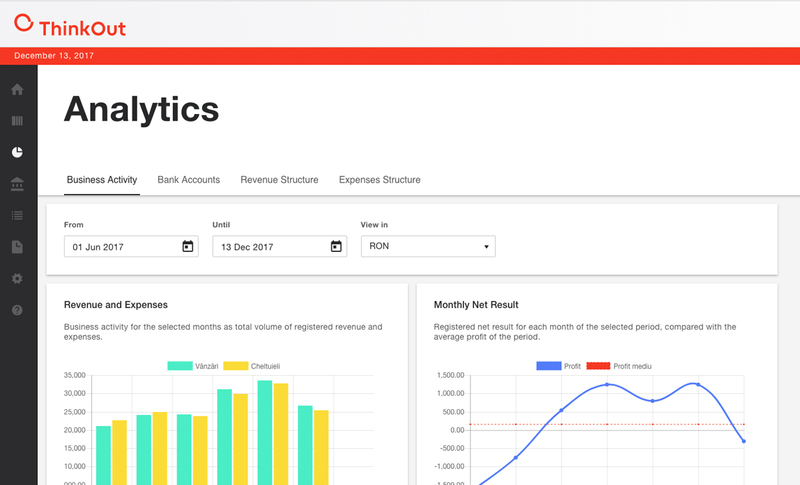 On a single screen you can check the total balance for your connected bank accounts, the cash runway given the current balance and the expense rate or the revenue and expenses of the past three months. 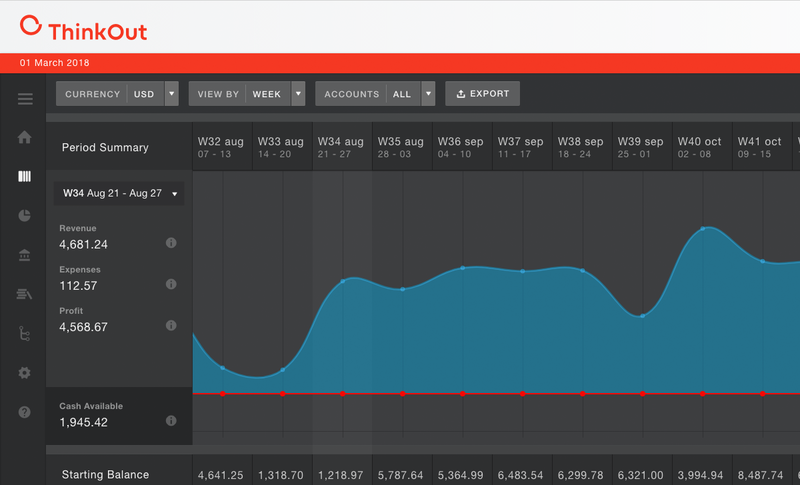 ThinkOut automatically fills in the cash flow plan with data from the bank account statements. It displays in an accessible, visual manner the way your company’s money is distributed on income and expense categories. 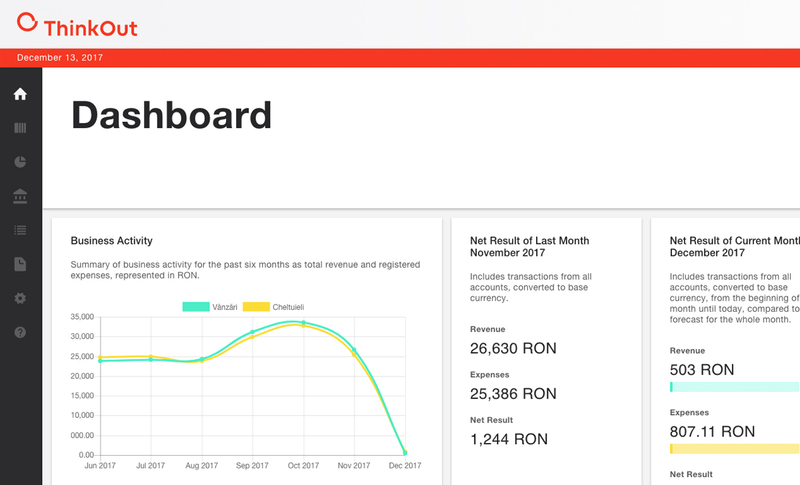 ThinkOut translates the transactions data into easy to understand charts that shine more light on how the income and expenses are structured and evolve. The platform gradually builds cash flow forecasts based on the business activity over the past years. This way you can plan your business according to anticipated income and expenses patterns. Follow how much cash is available and how the income, expenses and profit have evolved. Analyze all this data to make everyday business decisions. Why should you use ThinkOut? Because you want to understand why the company looks profitable on paper, while there isn’t enough money to pay your suppliers. A quick review of the ThinkOut cash plan will give you the answer. Because you want to know how soon you may run out of money, given the available cash and the current spending rhythm. A glance at the dashboard will tell you when this situation is possible to occur. Because you want to know exactly how money is spent in your company, what costs can be adjusted or which product/client generates more income. The income and expense structure and graphics will help you to see it clearly. Because you get financial information about your company faster and easier than if you used spreadsheets or read the accounting reports. Most of the operations are automated, from data aggregation to interpretation: filling in the income and expense categories directly from the bank account, currency conversion, reporting. They are more than just clients. They are our partners who helped us to better understand their problems in order to find the recipe for a proper “medicine”. They showed us the ropes on how to balance the income and the expenses when operating with large amounts of cash; on planning growth, but not having a clear path; on how it is like to wish to make future business plans but not knowing exactly where to start. These are natural challenges in a managers’ life and they chose ThinkOut to be their trusted advisor when making these kind of business decisions. Profile: Outdoor Advertising Specialised in providing outdoor advertising on the local and national market, our clients encounter a bit of an issue when it comes to controlling a large amount of transactions. When you’re intermediating between a client and a supplier, you have a great financial responsibility. Tracing cash transactions is mandatory, that’s why they chose ThinkOut as a helping hand. This way they know exactly what sum needs to be paid or cashed in on what day and how they can negotiate terms of payments. Profile: Management Consultancy After more than a decade in which BMG Consulting provided management consultancy for over 150 grants, they're still facing the uncertainty of the business environment. Working on long term based projects, cash flow forecasting can become really difficult. Late payments are never a joy, especially when they come in tranches. That’s why ThinkOut comes in handy when we talk about helping our clients with operating long term transactions. Profile: Leadership Development Passionate about their work, the people from Introspecials want to make a difference in the IT industry by serving SMEs and large companies through leadership development. Because they don’t want to lose track of what’s happening with their own business, they opted for ThinkOut. On the other hand, the collaborative part of ThinkOut helps the Introspecials management team to keep their cash flow record up to date. Profile: Information Technology The young, 50 employee company has a project based activity which faced rapid growth during the past years. Exciting as it is, there are two sides of the same coin: it increased the pressure on allocating financial resources. Delayed ROI and the uncertainty of the IT industry don’t get along well. Which is why they use ThinkOut to avoid cash flow gaps, learn how to prioritize expenses and how to plan income; and also decide when it is safe to grow further.